Hey Westchester! Have your kids’ schools participated in Computer Science Education Week’s “Hour of Code” yet? From December 9-15, 2013, schools all over the nation will dedicate just 1 hour to introduce kids and teens to computer programming. Suitable for ages 6-106 (that isn’t a typo! ), these tutorials for beginners cover coding on modern computer browsers, smartphones, and tablets alike. Don’t have a computer or device? That’s okay! They are also offering introductory programs for those with who just have a pencil & paper! I participated in Hour of Code yesterday by taking an interactive “Tutorial for beginners” that allowed me to write my first computer program. Bill Gates, Mark Zuckerberg, Chris Bosh, Angry Birds and Plants vs. Zombies were all part of the hour long session that included video tutorials and easy terminology to make learning the new concepts very simple! When people think of computer programming, they get intimidated. It involves lots of numbers and strings of unfamiliar syntax – but the Hour of Code tutorials take the intimidation factor out completely! Going through these introductory tutorials will give you a sense of accomplishment. And in my case, a desire to go even further with what I’ve learned! Parents – even if your kids’ schools aren’t participating, I urge you to sit down with them and encourage them to try out any of these introductory tutorials. Go through them together! You will be pleasantly surprised with the outcome. As for resources in your local community, check out: http://code.org/learn/local. I browsed it just yesterday and quickly realized that there are none listed in Westchester! I immediately applied to submit “The Digital Arts Experience” to the list of schools & camps that offer computer programming classes in Westchester and am waiting for approval. In the meantime, see what is in your area for kids and teens. Hour of Code is still in its newborn stages, and I feel that it will only grow larger as more people start to realize the importance of learning a computer language. Just a few days ago, it was announced that a $1 million investment was granted to New York City schools to expand their computer science programs. To quote Yi Yang of The Epoch Times, “In the near future, code may become the standard second language taught in city schools.” In the article, Yi further quotes Alayzia Griffin, a 10th-grade student at PS47 who participated in Hour of Code who said, “It’s actually a lot more fun than I thought it would be. It seems kind of intimidating, but it’s actually pretty easy”. At The Digital Arts Experience in Westchester, NY, we offer computer programming and coding classes after school, on weekends and summer break for kids and teens. Starting in January 2014, we will be running Game Programming with Scratch classes for kids as young as 7. Additionally, we will offering other coding classes in Processing, Java, and HTML for kids ages 9 and up. Check out what classes we will be offering and encourage your kid and their friends to get on board and take the initiative to learn code! Our classes are small sized, 100% hands on, goal oriented, and designed to give real world exposure. Set up a class for your kids and their friends today! Give us a call at (914) 644-8100 or e-mail Cristina at Cristina@TheDAE.com to get you started. Come on by for a tour and learn more about our facility and programs! Computer Science Education Week Dec. 9th – 15th : The Hour of Code 2013! At The Digital Arts Experience in White Plains, NY, we are proud to offer computer programming and coding classes after school, on weekends and summer break for kids and teens. With December 9th – 15th, 2013 being “Computer Science Education Week”, we wanted to highlight the importance of the initiative as well as raise awareness in the Westchester community. There is currently a plethora of social media coverage and support this week and the goal is to get more educators and schools involved. Not only is learning code an incredibly valuable skill, but it’s actually fun and not that difficult to learn! “We need young Americans like you to master the tools and technology that will change the way we do just about everything,” he said in his video. “Don’t just buy a new video game, make one. Don’t just download the latest app, help design it. Don’t just play on your phone, program it.” – President Obama, calling on U.S. students to learn code. We implore you to check out Code.org and learn an #HourOfCode! Take the challenge and find out for yourself that anybody can learn. Tweet your progress at @Codeorg and join the conversation with thousands of others! In the same breath, we are very excited to announce that we have opened up even more computer programming classes for younger kids and teens. 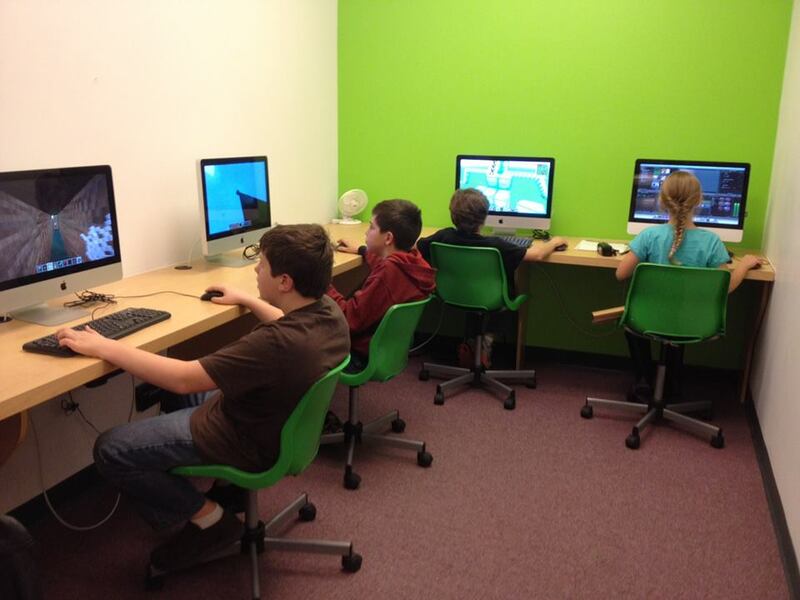 Starting in January 2014, we will be running Game Programming with Scratch classes for kids as young as 7. Additionally, we will offering more coding classes in Processing, Java, and HTML for kids ages 9 and up. Check out what classes we will be offering and encourage your kid and their friends to get on board and take the initiative to learn code! Our classes are small sized, 100% hands on, goal oriented, and designed to give real world exposure. Set up a class for your kids and their friends today! Give us a call at (914) 644-8100 or e-mail Cristina@TheDAE.com to get you started!